So these past three weeks (indeed this whole year) have been life-changing, defining, difficult, enriching, surprising, sad, busy, purposeful, supportive and a privilege – for me. We left our jobs. We sold our house and most of our stuff. And we moved into my father’s house to be with him as he battled Mesothelioma. My transition was from a full-time, employed, busy, professional, to a full-time carer giving medication around-the-clock and worrying as my father got weaker with each passing day. Stanley Frederick Smith passed away this morning at about 5am in hospital. I had seen him yesterday, and he gave me a huge smile when he opened his eyes and saw me – a gift. But I felt his time was limited. It was so sad to see such a clever mind be limited by illness and drugs: so sad to witness your own father grow weak. Of course I knew him as my father, but as I sorted through his files I got to see more of the person. He was a funny bloke who loved a joke. He loved to stir, rile and rouse others. His wit, puns, and jokes were a constant source of entertainment for others. But he was not a clown. He cannot be defined by one label. He wore many hats. He was: a professional; a manager; a boss; a methods engineer; a car lover; an artist; a friend to many; a president; an organizer; a leader; a committee man; an active member; a foodie; a cook; a HAM radio nut; a Morse code practitioner; a photographer; a joke teller; a conversationalist; a talker; a geek; an intellectual; interested in physics and astronomy and mathematics; a life long learner; a language learner; a family man; constant companion to Margaret; a life participant; an independent thinker; and a kind person. 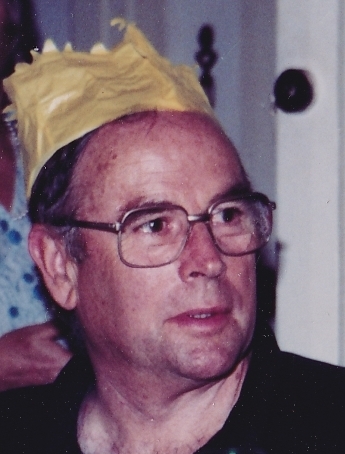 His files were full of jokes, photos of classic cars, caravans and caravan trips, people gathered in groups eating together, and people enjoying each others company. He was a people person. While his time has ended and he is probably reunited with my mother, my own life journey pauses between life chapters. We will mourn, pay tribute, share stories, then sort out the accumulated possessions and legalities. Then begin the next phase….I have some ideas.